When those darling little birds peck gaping wounds in your tomatoes, consider adding wind chimes to your garden décor. A creative and fun alternative to store bought chimes is a homemade creation that will become a conversation piece. 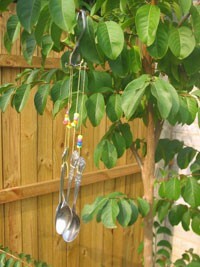 Using old silverware and some string, you can make a set of loud wind chimes that are whimsical and practical. And what better location for silverware wind chimes than in the garden, where your food originates? With needle nose pliers, bend every other tine of the fork at a right angle to the handle (see photo), and then curl the ends of the tines into circles, or eyes. Bend the handle of the fork into a hook. Cut four or five 10" lengths of string, twine, or yarn. The number of lengths you need is determined by the number of tines on the fork. Add beads to the string as an embellishment at this time. Tie one end of each string onto the handle of a spoon, then thread the other end through the eye on a tine of the fork. Repeat this for the remaining spoons. All of the spoons need to hang at the same distance from the tines so that they will strike one another to make a sound. 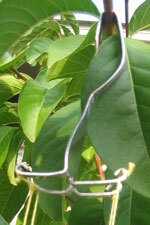 Hang your silverware wind chimes in the garden, outside a kitchen window, or near a picnic area. These make fun gifts for children to create. Many second hand stores have a selection of used silverware, and discount stores sell inexpensive bundles of silverware. I warm my forks in the oven (it makes them more pliable). Then I use needle nose pliers to curl the prongs.